1. In a bowl, beat together the butter and sugar with an electric whisk until pale and creamy. Add the egg and syrup, then sift in the flour and spice. Mix well to form a dough. Shape into a flat ball or disc, and then wrap in clingfilm and chill in the fridge for about 30 minutes. 2. Preheat the oven to 190°C, gas mark 5, and line 2 baking sheets with parchment paper. Unwrap the dough, place between 2 sheets of clingfilm, and roll out to about 5mm thick. Using a Waitrose Robin Cookie Cutter cut out 20-24 shapes. 3. Place the biscuit shapes on the baking sheets and bake for 10-12 minutes, or until golden brown. Remove from the oven and leave to cool for 5 minutes on the tray before transferring to a wire rack to cool completely. 4. To decorate, soften the icing according to the pack instructions. Using a disposable piping bag with a small writing nozzle, pipe a little roundel of icing on each robin’s breast, then smooth with a small palette knife dipped in hot water. Stick half a glacé cherry on top, leaving a little of the white exposed. 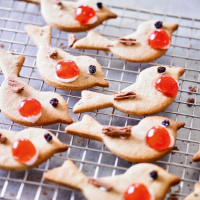 Then use a small dot of icing to fix a currant for the robin’s eye. 5. To make the wings, cut the Flake into 2-3cm-long pieces, then cut each length in half and half again (to make 12-16 sticks from each Flake). Use a dot of icing to secure a stick of Flake for the wing. Leave the icing to set before serving. This recipe was first published in Wed Nov 09 10:56:00 GMT 2016.